In a non-fiction book, tables are an aid to making information and data easier to read. Columns can also be used to help with readability, although it’s not common to have columns in a book. If you do have tables in your book, the use of color will make a table more appealing for your reader, and help with readability. But color printing can be expensive, and could make your book unviable. Instead, you can use shades of grey in your table; this will still make a plain table more appealing, but won’t raise the cost of your book. If you’re designing a PDF ebook, there are no concerns about using color – just don’t overdo it. To insert a table click your pointer where you want the table, and click the Insert tab. Click the Table drop down arrow, then move your pointer across to the right and down the blocks for the number of columns (across) and rows (down) your need. For example, move your pointer across 3 blocks, and down 2 blocks (see the screenshot below). NOTE: You can also use the Insert > Table option where you enter the number of columns and rows. 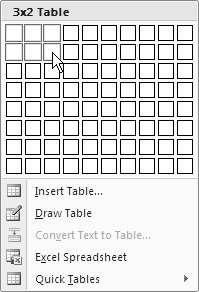 Click the bottom right block to insert the table (see arrow above). The table will be placed on your page as in the example below. A plain table is… well, boring. 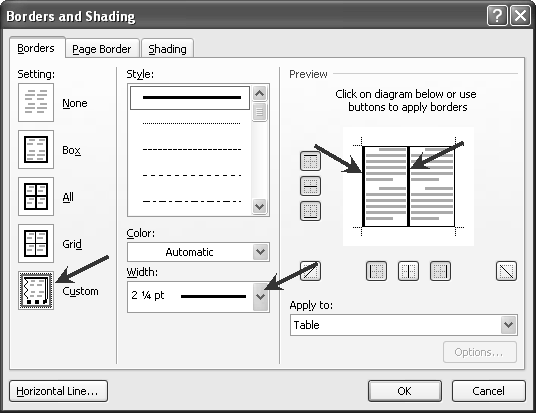 To add some interest to your table, you can add shading, and you can change the borders. It’s quick and easy to add shading or change the borders of a table. 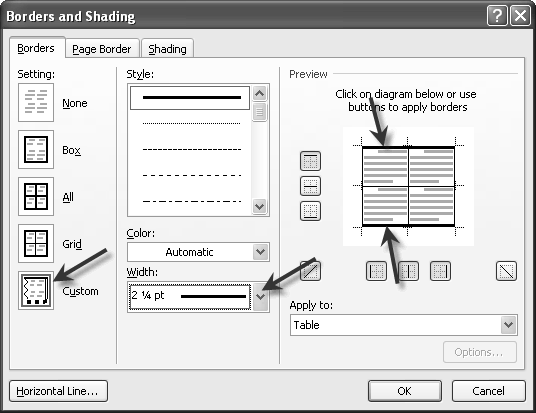 Select the row you want to add shading to. Or select a column if you want to add shading to a column. Place your pointer to the left of the row and click to select it. To select a column, place your pointer above the column and click. On the Home tab, click the Borders and Shading drop down menu. Click the Borders and Shading option on the drop down menu. Click the Shading tab on the Borders and Shading window. Click the Fill drop down menu, then click on the color you want to use. NOTE: Choose a light color otherwise it is detrimental to the readability of your text. Similarly, it’s not advisable to use a pattern fill (Style option). To select the whole table, move your pointer over the table until the blue cross displays at the top left corner (see below). Click the blue cross. The whole table will be selected. Click the Borders and Shading drop down menu. The Borders options should be displaying. If not, click the Borders tab. 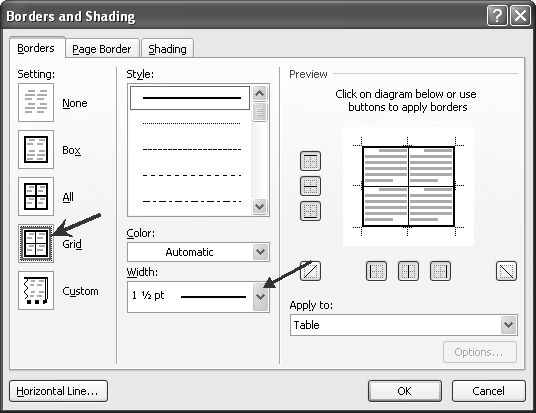 To change the outside border of the table to a thicker line, click the Grid option (see below). Click the Width drop down menu and choose the width of the line you want to use. Your table will now have a thicker border around the outside (see example below). To change the width of lines within the table, select the row or column. 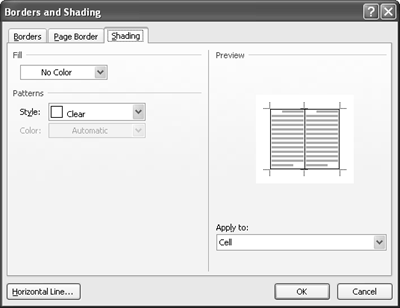 To change the top and bottom borders of the row to a thicker line, click the Custom option. In the Preview section of the window, click the top and bottom lines. Your table will now have a thicker border at the top and bottom of the row (see example below). To change the left or right borders of the column to a thicker line, select the column. 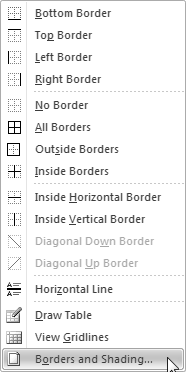 Open the Borders and Shading window and click the Custom option. In the Preview section of the window, click the left and/or right lines. Your table will now have a thicker border at the left and right of the column (see example below). To change the width of a column, place your pointer on the line between the columns until the two lines with arrows displays (see below). With this cursor displaying hold down and drag the line to the left or right. Alternatively, you can use the Height option. Select the column you want to adjust. Click the Layout tab. Change the width of the column using the Width option. This can also be done for row heights. Select the row you want to adjust. Click the Layout tab. Change the height of the row using the Height option. If you change the height of a row, you should probably change the alignment of the text (otherwise the text will sit at the top of the row). Select the row and click the Layout tab. Choose the alignment option in the Alignment frame. Columns are usually only found in large format coffee table books, and not in the regular trade books. NOTE: If you want to add columns within your text, that is, only a small part, you can use a table, with the borders turned off. Click the Columns drop down menu; choose and click the number of columns you want, e.g. click Two if you want 2 columns. Start typing at the top of the left column. Note that as you type your text and you get to the end of the first column, the text will continue at the top of the second column. When you get to the end of the second column, the text will continue at the top of the first column, on the next page. To change the spacing on the edge of your text within the column, you need to adjust the Left Indent and Right Indent. Move the Left Indent button to the left or right, as needed. This will adjust the space between the left-hand edge of the column and the text. Move the Right Indent button to the left or right, as needed. This will adjust the space between the right-hand edge of the column and the text. In the next post we continue with interior design elements. Pingback: AME Blog Carnival: Tips and Tricks for Writers and Authors - July 28, 2014 - Author Marketing Experts, Inc.